by Levine, David M.; Stephan, David F.; Szabat, Kathryn A. For one- or two-semester business statistics courses. This text is the gold standard for learning how to use Microsoft Excel® in business statistics, helping students gain the understanding they need to be successful in their careers. The authors present statistics in the context of specific business fields; full chapters on business analytics further prepare students for success in their professions. Current data throughout the text lets students practice analyzing the types of data they will see in their professions. The friendly writing style include tips throughout to encourage learning. MyStatLab is an online homework, tutorial, and assessment program designed to work with this text to engage students and improve results. Within its structured environment, students practice what they learn, test their understanding, and pursue a personalized study plan that helps them absorb course material and understand difficult concepts. David M. Levine is Professor Emeritus of Statistics and Computer Information Systems at Baruch College (City University of New York). He received B.B.A. and M.B.A. degrees in statistics from City College of New York and a Ph.D. from New York University in industrial engineering and operations research. He is nationally recognized as a leading innovator in statistics education and is the co-author of 14 books, including such best-selling statistics textbooks as Statistics for Managers Using Microsoft Excel, Basic Business Statistics: Concepts and Applications, Business Statistics: A First Course, and Applied Statistics for Engineers and Scientists Using Microsoft Excel and Minitab. He also is the co-author of Even You Can Learn Statistics: A Guide for Everyone Who Has Ever Been Afraid of Statistics, currently in its second edition, Six Sigma for Green Belts and Champions and Design for Six Sigma for Green Belts and Champions, and the author of Statistics for Six Sigma Green Belts, all published by FT Press, a Pearson imprint, and Quality Management, third edition, McGraw-Hill/Irwin. He is also the author of Video Review of Statistics and Video Review of Probability, both published by Video Aided Instruction, and the statistics module of the MBA primer published by Cengage Learning. He has published articles in various journals, including Psychometrika, The American Statistician, Communications in Statistics, Decision Sciences Journal of Innovative Education, Multivariate Behavioral Research, Journal of Systems Management, Quality Progress, and The American Anthropologist, and he has given numerous talks at the Decision Sciences Institute (DSI), American Statistical Association (ASA), and Making Statistics More Effective in Schools and Business (MSMESB) conferences. Levine has also received several awards for outstanding teaching and curriculum development from Baruch College. David F. Stephan is an independent instructional technologist. He was an Instructor/Lecturer of Computer Information Systems at Baruch College (City University of New York) for over 20 years and also served as an Assistant to the Provost and to the Dean of the School of Business & Public Administration for computing. He pioneered the use of computer classrooms for business teaching, devised interdisciplinary multimedia tools, and created techniques for teaching computer applications in a business context. He also conducted the first large-scale controlled experiment to show the benefit of teaching Microsoft Excel in a business case context to undergraduate students. An avid developer, he created multimedia courseware while serving as the Assistant Director of a Fund for the Improvement of Postsecondary Education (FIPSE) project at Baruch College. 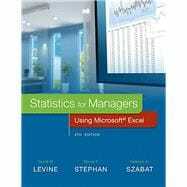 Stephan is also the originator of PHStat, the Pearson Education statistical add-in for Microsoft Excel and a co-author of Even You Can Learn Statistics: A Guide for Everyone Who Has Ever Been Afraid of Statistics and Practical Statistics by Example Using Microsoft Excel and Minitab. He is currently developing ways to extend the instructional materials that he and his co-authors develop to mobile and cloud computing platforms as well as develop social-media facilitated means to support learning in introductory business statistics courses. Stephan received a B.A. in geology from Franklin and Marshall College and a M.S. in computer methodology from Baruch College (City University of New York). Kathryn A. Szabat is Associate Professor and Chair of Business Systems and Analytics at LaSalle University. She teaches undergraduate and graduate courses in business statistics and operations management. She also teaches as Visiting Professor at the Ecole Superieure de Commerce et de Management (ESCEM) in France. Szabat’s research has been published in International Journal of Applied Decision Sciences, Accounting Education, Journal of Applied Business and Economics, Journal of Healthcare Management, and Journal of Management Studies. Scholarly chapters have appeared in Managing Adaptability, Intervention, and People in Enterprise Information Systems; Managing, Trade, Economies and International Business; Encyclopedia of Statistics in Behavioral Science; and Statistical Methods in Longitudinal Research. Szabat has provided statistical advice to numerous business, non-business, and academic communities. Her more recent involvement has been in the areas of education, medicine, and nonprofit capacity building. Szabat received a B.S. in mathematics from State University of New York at Albany and M.S. and Ph.D. degrees in statistics, with a cognate in operations research, from the Wharton School of the University of Pennsylvania. USING STATISTICS: Differing Means for Selling Streaming Media Players at Arlingtons? B.1 Which Excel Do You Use?